Facebook has become the most important part of our life. We all share our daily moments on it with friends. Sharing our Facebook albums with friends on Facebook is easy but what about those who do not have Facebook account. Although, it is not possible that a person do not have Facebook account. Still we can share our Facebook albums via email with public links to people not using Facebook. In this tutorial, I will share how to create a public link of Facebook album and share it with friends. Step 1: Log in to your Facebook account. Step 2: Click on Photos in the left side bar just below your profile picture. 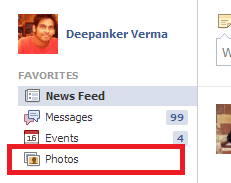 Step 3: Now click on Albums to see all your Facebook albums. Step 4: Now select your album which you want to share. In the album page, click on the gear icon and select share album. Step 5: It will open a dialog box with a link. Copy this link and share it with your friends. Now send this link to your friend via email or Facebook messages. To share this album with twitter followers, share this link on Twitter. The process was easy. If you are still facing any problem, comment below and share your problem with us.